Mailing your credit card payment late may not seem like a big deal, but late payment fees can add up to big dollars, and consistently failing to pay on time can have long-term financial consequences. Here are five reasons why you should pay your credit card bills on time. 1. Avoid Credit Card Late Fees. Ninety-five percent of credit cards examined by Consumer Action in 2009 charged late fees. The top fee was $39, and the average late fee was $28.19, a 9 percent increase over the average late fee in 2008. All of the top eight credit card companies use a tiered structure for charging late fees, with higher fees for higher balances. But the ranges of balances used for tiered fees have been compressed in the last several years, reports the Center for Responsible Lending. Five years ago, the highest late fees were for balances over $1,000. Now the highest late fees are applied to balances of just $250 and more, a category into which almost 9 in 10 consumers fall. 2. Don't Give Credit Card Companies a Chance to Hike Interest. When the bulk of the new federal Credit Card Accountability, Responsibility and Disclosure Act goes into effect February 22, credit card companies will not be allowed to increase interest rates on existing balances--except when customers are more than 60 days late on their payments. If you're already having a difficult time making the minimum payments on your credit cards, you can bet you'll have an even tougher time if the interest rate goes up. 3. Maintain Your Credit Card Limit. 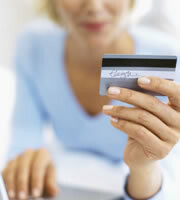 Credit card issuers will perceive you as a risk and could lower your credit limit if you don't pay your bills on time. 4. Preserve Your Good Credit Score. Your payment history accounts for 35 percent of your FICO score, the most widely used credit score. Your score won't plummet with just one late payment, but repeat late payments on a number of cards could cause a serious dent. 5. Protect Your Long-Term Credit. Paying your bills late now could have consequences years later when you apply for an auto loan, mortgage, or another credit card. Late payments stay on your credit report for up to seven years. 0 Responses to "Five Reasons to Pay Your Credit Card Bill On Time"